1. Dwarf hamsters are very nervous little creatures and will escape every chance they get. When it comes to dwarf hamster care, the best home for a dwarf hamster is the tubular plastic sort. Take notice of the size of the tubes and think small when it comes to your hamster’s home. 2. Dwarf hamster cages are also a viable option. Your dwarf hamster can comfortably live in a wire cage as long as the wires are very close together. 3. Give your hamster fresh food and water daily, and something to chew on for its teeth. 4. Anyone with hamsters as pets knows the importance of having an exercise wheel. Purchase a tiny wheel, specially sized for your dwarf hamster. 5. Line the bottom of your hamster’s home with something it can burrow into, like wood shavings. Stay away from pine and cedar. 6. 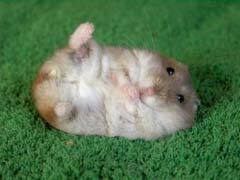 For dwarf care to the largest teddy bear hamster care, all hamsters have a private side and like to build nests. Provide a box inside your hamster’s home for that purpose. 7. Remove and replace the floor covering and wash your hamster’s home once a week. Now that you know the basics of dwarf hamster care, it’s time to head to the pet store to choose your new little friend. Dwarf hamsters are so cute and easy to care for that you may want to get two or three!